Utopian Coffee has been based in downtown Fort Wayne for the past five years, but you might not have seen it. Instead of a coffee shop, the company roasts coffee on site at 222 Pearl St. and sells it online for wholesale and retail. Now, Utopian is moving a few blocks away to historic Columbia Street where it's preparing to open its inaugural café on The Landing, a revived cultural district under construction and set to open in 2019. In February, Utopian Coffee was the first business to announce that it will be a future tenant on The Landing. Then in September, a second announcement came out. Utopian’s founder, Brendon Maxwell, is partnering with the owner of Winona Lake’s Cerulean restaurant, Caleb France, to open a brewery on The Landing, too. As these new ventures take shape, Input Fort Wayne sat down with Maxwell to learn more about his journey as an entrepreneur, his interest in Columbia Street, and his vision for two unique spaces that promise to shape downtown Fort Wayne's social scene. The Landing will be an urban neighborhood with offices, apartments, and retail spaces. IFW: You used to live in Silicon Valley. Did you always know that you wanted to be an entrepreneur yourself? BM: I was born and raised here in Fort Wayne, and I went to high school here. I then ended up going to college in northern California, so I was living in Silicon Valley, and I had friends who worked for Google, Yahoo, and a few other startups. But I didn’t know that I wanted to be an entrepreneur myself right away. I started a couple small projects in high school and college, so I knew that I had an entrepreneurial bug. But I was actually intending to go to medical school at first. Then, I went on a trip overseas in college to visit my brother, and we went backpacking, and I realized that I didn’t want to be in school for another seven years. I’d much rather travel. 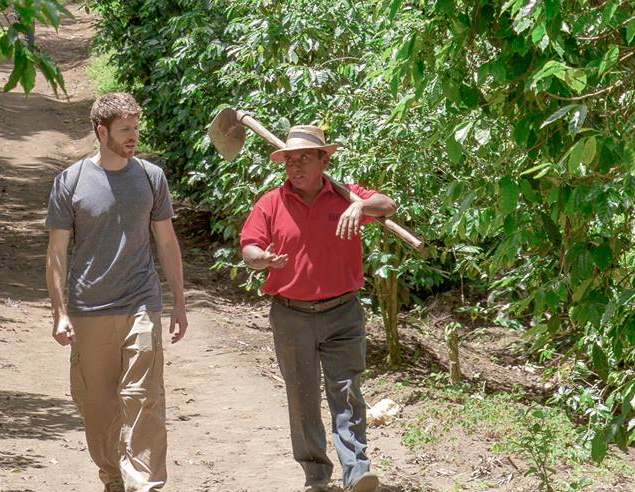 A lot of the countries that my brother and I visited were countries that were growing coffee, and my cousin was roasting coffee at the time, and so going into the coffee business was a natural fit. After that, my cousin and I decided to start Utopian as a way to sell coffee online. IFW: When most people think of coffee companies, they probably think of coffee shops. But tell us about the world of online coffee sales. BM: We knew going into it that the brick-and-mortar café model was a very different business, and we didn’t want to take that on initially. Utopian hasn’t had a cafe for the last 12 years we’ve been in existence. We really came into coffee with a focus on the roasting side and on the origin side. That’s where my interest was—in traveling overseas, meeting farmers, and figuring out how we could come alongside and partner with them to tell their stories. So we started selling coffee online by the bag in 2006, and then a couple years later, we started a wholesaling division—selling to cafes, businesses, churches, and restaurants. We also added a gifting division. But a big focus of our mission is telling stories about the coffee industry around the world. Maxwell, left, meets with farmers overseas. IFW: Speaking of that, Utopian works in many countries. Tell us about how you’re impacting communities around the world. BM: At the beginning, we were working mostly through importers, so we were buying like most other companies buy. Then we started developing relationships with farmers in a variety of countries. Our main regions are Central America, South America, Southeast Asia, and East Africa. Our big project has been converting cocaine farms to coffee farms in Colombia, which is pretty wild work. But it’s incredible what the farmers in Colombia are doing, how they’ve transitioned out of this really dangerous, illicit trade into coffee, and how they’re having awesome success. We get to be a part of that story, which always amazes me that this is my job. We actually have a mini documentary we’ve filmed about it that we’re getting ready to launch with our rebrand of Utopian (hopefully in the next four to six weeks). In East Africa, we’ve been working in Rwanda and Congo, where there are some really powerful stories, too. After the genocide in Rwanda, most of the men were gone, or they were the ones committing the atrocities, so they were imprisoned. Then the women of these two previously warring ethnicities, the Hutu and Tutsi, got together and started this female-owned co-op. So we’ve been able to be part of that story, supporting them, and visiting with them. We tried to do some work in Congo, as well, which is in much worse shape than Rwanda. I think it was called the worst place in the world to be a female, so we’re just trying to create some opportunities for women there. In Thailand, we’re working on anti-trafficking. The big vision is to use coffee as a means by which girls and women can be brought into safe employment. Most of the situation in Thailand is an economic one, so being able to help women find gainful employment is important. IFW: Utopian has been based in downtown Fort Wayne for more than 10 years now. What inspired you to put your business in Fort Wayne, of all places? BM: The easy answer is that in the beginning, we didn’t have any money, and Fort Wayne was home, so it was easy it be here. But I had long been interested in being a part of downtown Fort Wayne, specifically. We’ve been in this building for five years, and then we were in the A Party Apart building for five years before this, so for us, it was just about being downtown, and investing in this place. Even when we didn’t have a lot to invest, we just wanted to be present. Now, as we move into our new space on The Landing, there’s even more that is being done in downtown Fort Wayne, and we’re excited to be a small part of it. 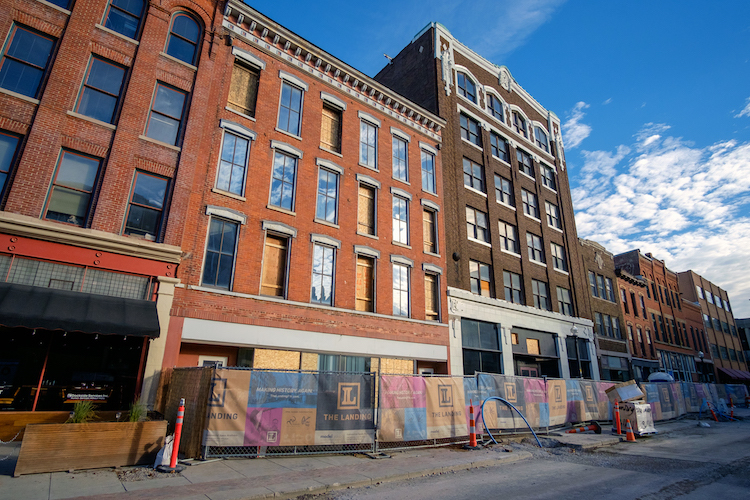 The Fisher Brothers Paper Co. building formerly occupied by Flashbacks is under construction. IFW: You’re moving all of your operations at Utopian to the Landing, and opening Utopian’s first coffee shop. Tell us about that decision. BM: We love this building, and we wouldn’t be leaving it if we weren’t outgrowing it. But yes, we’re moving our whole operation to The Landing, and we’ll be leasing out our current space. So we’re opening a brick-and-mortar location, and we’re ready for it. Our business is at a different place now. We have the stability and the resources to make an investment in something like this. We’ve also made an intentional decision last year to hire a guy who has a barista background, and he’s going to help be the conduit between the roasting company and the café and oversee this transition. We’re really excited for what it can be. IFW: Of all the cool spaces in downtown Fort Wayne, why The Landing for your first shop? BM: So much of it for us was the vision of Model Group, what they’ve done in Cincinnati with Over-The-Rhine is amazing. The restoration, not just of the physical buildings, but in the community is impressive. In 2001, Over the Rhine was called the most dangerous neighborhood in America, and they really brought it back to life. Now it’s a popular destination with great restaurants and bars and shopping. I’m just excited for them to bring that experience and that vision to the Landing. That’s really what won us over. Model Group looks at development differently; they see it as a community investment. They’re long-term holders. Most commercial real estate companies are looking to flip properties in a few years, make money, and move on to the next project. But these guys work on developments that they own for decades, so that shows me that they’re committed to building communities. Many spaces on The Landing are being brought back to their former glory with original brick walls and decorative ceilings. IFW: In addition to a new location for Utopian, you’re also partnering with Caleb of Cerulean in Winona Lake to open a new brewery on the Landing. Tell us about that. 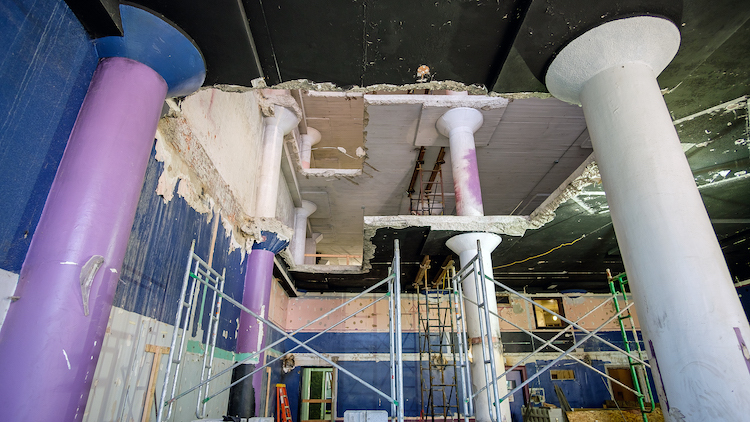 BM: The initial plan was to put our Utopian coffee shop in the large Fisher Brothers Building at 118 W. Columbia Street (previously occupied by Flashbacks). But the developers also wanted to put a brewery on The Landing. I had previously suggested Cerulean as a restaurant, and the owner, Caleb, said he would do a brewery, but only on one condition: That I was his business partner. So that’s how I got brought into it. Now, the plan is that we’re going to have Utopian’s café at 122 W. Columbia Street in a smaller space adjacent to the brewery. The cafe and the brewery will both serve excellent food. Caleb has a lot of experience with fantastic food having started Cerulean. But more than the food, we’re planning to focus on craft beverages. We’re going to be roasting coffee on site. We’re going to be brewing beer on site. It’s going to be fun! IFW: The historic location doesn’t hurt either. 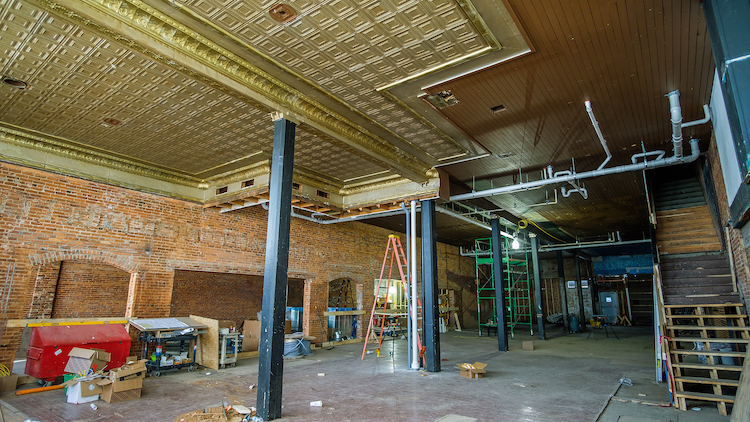 Tell us about the space at 118 W. Columbia Street where the brewery will go. BM: It has a lot of history. Before it was Flashbacks, it was the Fisher Brothers Paper Company. They still have the spiral staircase that runs all the way through that they used to send reams of paper down, so we’re keeping that. Flashbacks had this purple carpet covering the majority of the floor, and what was underneath was original terrazzo floor. It’s incredible and from 1914. This main floor was their retail space, so we’re going to be able to bring all of that back, which is exciting. IFW: What would you tell other entrepreneurs from big cities considering the move to Fort Wayne? BM: I think there’s a lot of opportunity here. There’s tremendous potential. I still have friends in Silicon Valley, but several of them have moved out. It’s just not sustainable. The rent’s high and things happening there are a bit of a bubble. In Fort Wayne, there is a lot of opportunity to make an impact, especially as a young person, and I think that’s what people are looking for when they’re leaving college. They want to be able to have an impact in one form or another. Being in California is great, but I’m super happy to be back.